Country --Select--USA (United States)MexicoCanadaAlbaniaAlgeriaAndorraAngolaAnguillaAntigua And BarbudaArgentinaArmeniaArubaAustraliaAustriaAzerbaijanBahamasBahrainBangladeshBarbadosBelarusBelgiumBelizeBelizeBermudaBhutanBoliviaBosnia And HerzegovinaBotswanaBrazilBritish Virgin IslandsBrunei DarussalamBulgariaCambodiaCameroonCayman IslandsChannel IslandsChileChinaColombiaCosta RicaCote D'IvoireCroatiaCubaCuracaoCyprusCzech RepublicDemocratic Republic of CongoDenmarkDominicaDominican RepublicEcuadorEgyptEl SalvadorEnglandEquatorial GuineaEritreaEstoniaEthiopiaFijiFinlandFranceFrench PolynesiaGabonGambiaGeorgiaGermanyGhanaGreeceGrenadaGuadeloupeGuamGuatemalaGuyanaHaitiHondurasHong Kong SARHungaryIcelandIndiaIndonesiaIranIraqIrelandIsraelItalyJamaicaJapanJordanKazakhstanKenyaKorea, Republic OfKuwaitKyrgyzstanLao People'S Democratic RepublicLatviaLebanonLibyan Arab JamahiriyaLithuaniaLuxembourgMacau (San), ChinaMacedonia (Fyrom)MalawiMalaysiaMaldivesMaltaMangoliaMartiniqueMauritiusMonacoMongoliaMontenegroMoroccoMozambiqueMyanmarNamibiaNepalNetherlandsNetherlands AntillesNew CaledoniaNew ZealandNicaraguaNigeriaNo Country Northern IrelandNorthern Mariana IslandsNorwayOmanPakistanPalauPanamaPapua New GuineaParaguayPeruPhilippinesPolandPortugalPuerto RicoQatarRepublic Of MoldovaReunionRomaniaRussian FederationRwandaSaint Kitts And NevisSaint LuciaSaint Vincent And The GrenadinesSan MarinoSaudi ArabiaScotlandSenegalSerbiaSeychellesSingaporeSlovakiaSloveniaSouth AfricaSpainSri LankaSt. MaartenSudanSwazilandSwedenSwitzerlandTaiwanThailandTrinidad And TobagoTunisiaTurkeyTurkey1Turks And Caicos IslandsU.S. Virgin IslandsUgandaUkraineUnited Arab EmiratesUnited KingdomUnited Republic of TanzaniaUruguayUzbekistanVanuatuVenezuelaVietnamWalesZambiaZimbabwe This field is required. BEST WESTERN InnSuites Albuquerque Airport InnSuites Hotel & Suites is the ideal location for the small meeting planner. With conference facilities for 10 – 40 people, we are your small meeting specialists! Catering, Audio Visual Equipment and free High Speed Internet access are available for your meeting success. Enjoy our Business Center with free high speed internet access plus limited fax and copy service, free local phone calls and other business support services, making your next meeting a very special event! In addition to BEST WESTERN InnSuites Albuquerque Airport’s Meeting Rooms, enjoy our spacious Unique Boutique Lobby, Patio and Pool area for getting your group to enjoy the great New Mexico weather with breakout sessions, coffee breaks or outdoor lunch. 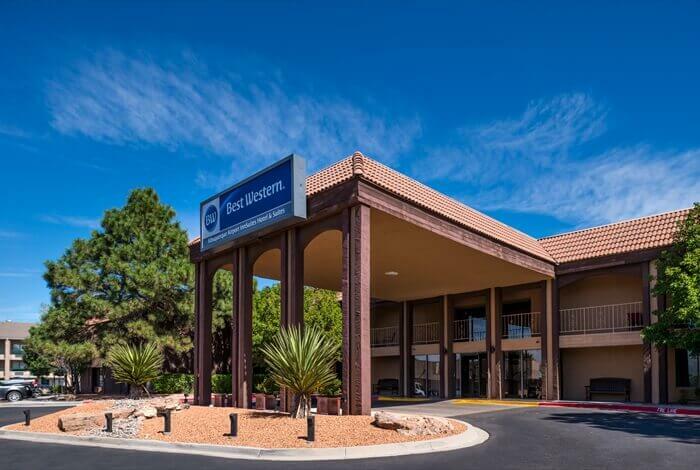 For business executives who wish to ship their conference, meeting or other information, please address to Guest Name, c/o BEST WESTERN Airport Albuquerque InnSuites Hotel & Suites, 2400 Yale Boulevard SE, Albuquerque, New Mexico 87106. We suggest one of the following methods of shipment: UPS, FedEx, United States Postal Service. 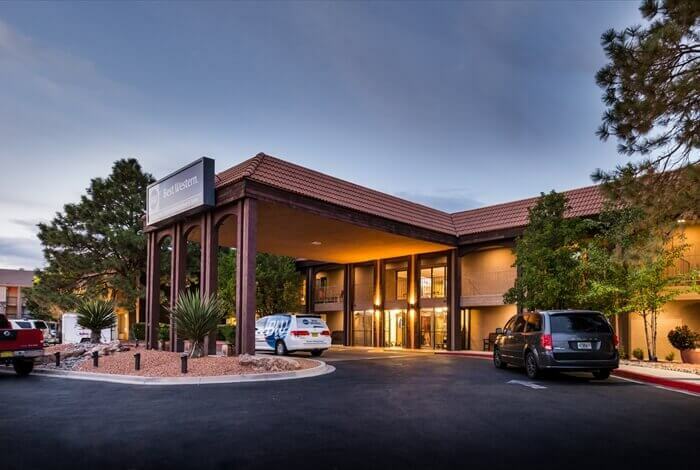 For a sales packet or additional information about holding an event at Hotel Albuquerque Airport InnSuites BEST WESTERN, please call 1-877-771-7810. Let BEST WESTERN InnSuites Albuquerque help make your wedding a success. Our professional sales and event staff works with you to accommodate your family and friends and create a memorable wedding. Let our professional Sales Department take some of the pressure off of you to make sure your wedding is a successful one to remember. For more information, please call 1-877-771-7810. 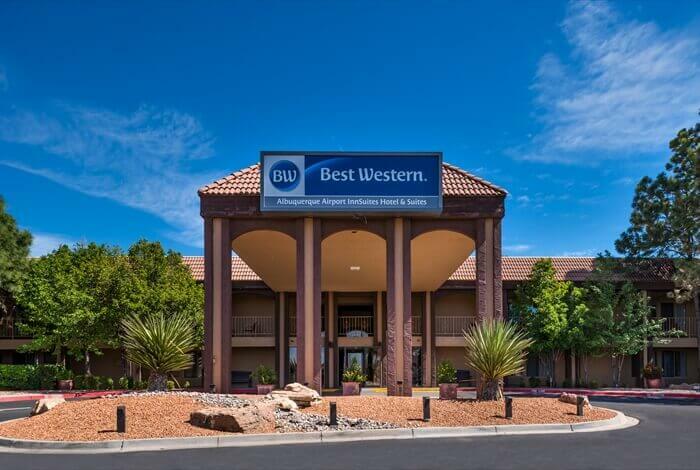 Let BEST WESTERN InnSuites Albuquerque help make your next event a success. Our professional sales and event staff offers flexibility and the ability to coordinate exciting events, including theme parties and meal functions. We can accommodate small groups or can make recommendations on large groups. We offer a wide variety of meal choices to suite any palate within various budgets. Whether it is classroom and business or reception and leisure we have what it takes to make your next event feel seamless and enjoyable. Let our professional Sales Department take some of the pressure off of your meeting planners to make sure your event is a successful one to remember. Our professional sales and event staff works with many catering professionals to coordinate exciting events, including theme parties and meal functions. The caterers we work with offer a wide variety of meal choices to suite any palate within various budgets. For more information, please call 11-877-771-7810. 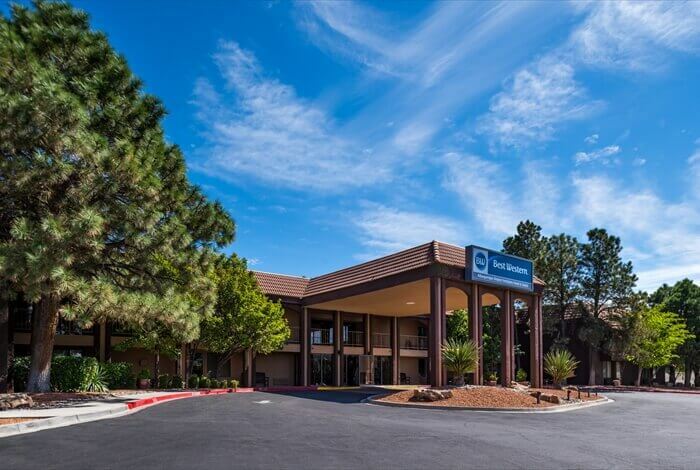 BEST WESTERN InnSuites is located at the Albuquerque International Airport (ABQ) in New Mexico. Come immerse yourself in our rich culture and heritage, rooted in centuries of history. Soak in our blue skies and sun that shines 310 days a year- perfect for outdoor activities. Breathe in the high desert air scented with sage and piñon, and you’ll understand why Albuquerque, NM is a destination like no other. Looking for a fun adventure? Allow the front desk to arrange a day of high desert exploration, horseback riding or hot–air ballooning. Enjoy a visit to Rio Grande Botanical Gardens, Sandia Peak Tram or breath-taking sunset. To set up a rate agreement, please call our Sales Department at 1-877-771-7810. InnSuites Hotels is committed to giving you up to date information and sharing your experience with InnSuites Hotels through social media including Facebook, Twitter, Foursquare and more. Albuquerque is bordered on the east by the Sandia and Manzano Mountains, on the west by Petroglyph National Monument, to the north by Sandia Pueblo and to the south by Isleta Pueblo. InnSuites Hotel & Suites offers 'Your Suite Choice' - Value from Arizona and California to New Mexico and Texas with free InnSuites Extras and amenities. Stay where comfort meets value at InnSuites Hotels. Find hotel deals and outstanding accommodations with award-winning value at all of InnSuites Hotel’s locations. InnSuites Hotels is certain to please both the busy executive and the leisure traveler with our amenities, free extras and InnCentives program. 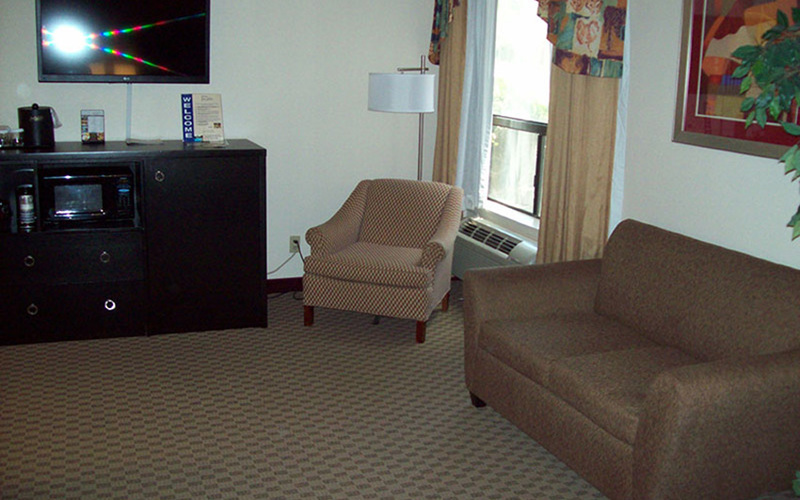 Why stay at inferior hotels with the hotel deals InnSuites offers? Providing guest amenities, value and service to our guests and associates. Copyright 2019 InnSuites Hotels & Suites. All rights reserved.